Join us for the first of a series of events, as a Beginners Guide to a range of cryptocurrency and blockchain technology related topics. 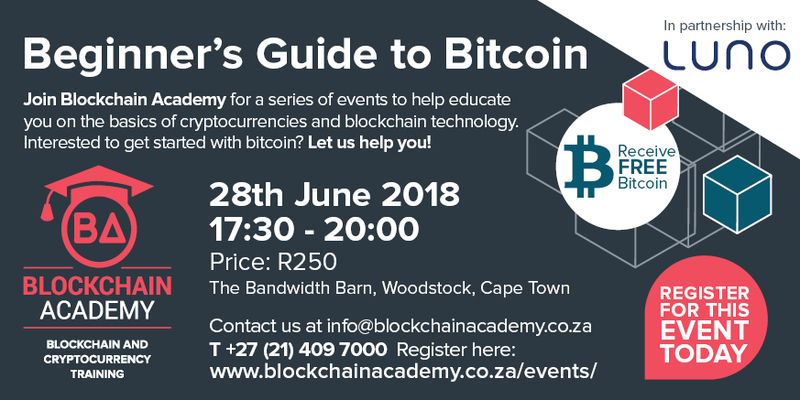 The first event, will be a beginners guide to learning about bitcoin and in partnership with South Africa’s first bitcoin exchange, Luno. This session is designed for individuals who just want to learn the basics and not delve into the technicalities of how this technology works. This event is sponsored by Luno. South Africa’s first bitcoin exchange. From investing, trading, mining bitcoin, the opportunities definitely exist. This event is for individuals looking for a crash course on bitcoin: how to get started using bitcoin, buying, selling on local and international cryptocurrency exchanges, securely storing bitcoin in a wallet, sending and receiving bitcoin and learning about the risks and regulation that governments are imposing on cryptocurrency exchanges. Why is bitcoin so revolutionary? What should I know about tax (income and capital gain/loss) when trading cryptocurrencies?